I will not be going .... However I'm sure the rest will like to see it ! Wow Jim Your technique of knock down structure is a really cool idea. I love your sign making video, a very helpful ideas, a very well done video. Great information Jim, thanks for taking the time to present it to us! Great article, Jim. Thanks for putting it together. I've finished my article about applying these "painted on signs" [link]. Thanks Todd! So far I'm quite happy that I made it so I can take it apart. I still intend to go back and detail the interior, and I have some electrical work to finish too, so there's that. I just watched the video where you take the building apart and that is clever and your craftsmanship really shows. 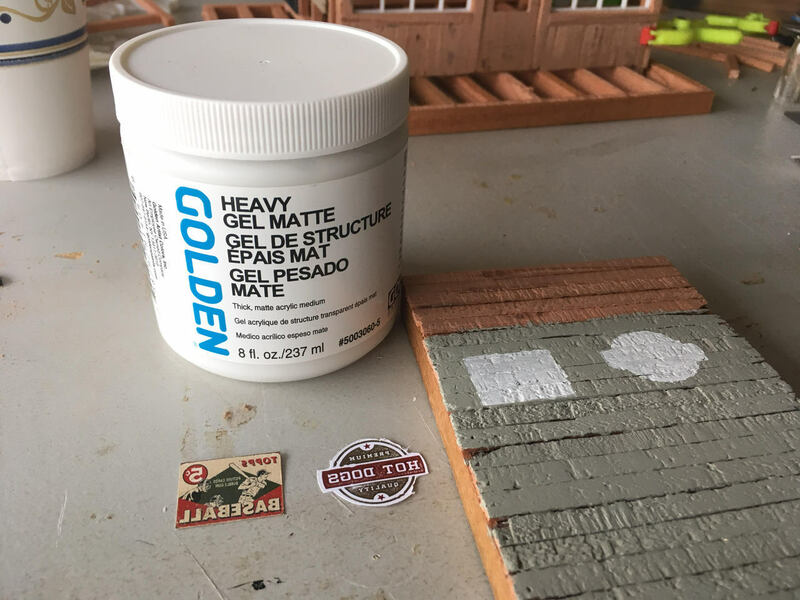 I have 2 large buildings on my RR that can each be broken down into 3 pieces but they are rough wooden boxes compared to your model. I had to build these in pieces to be assembled on site. One actually appeared in the Garden Railways back page "If I'd Only Known" years ago. I bought the Mod Podge photo transfer medium. I haven't used it yet. There are are two types. photo transfer and image transfer. I think I got the photo transfer kind.But it says: "Can be applied to surfaces such as wood, canvas, terra cotta, metal, and fabric". And on fabric is washable. But on glassware it says its a decal and can not be washed. So from the sounds of it it can be applied to anything but will only have real staying power if on something with some tooth to hold the gel. 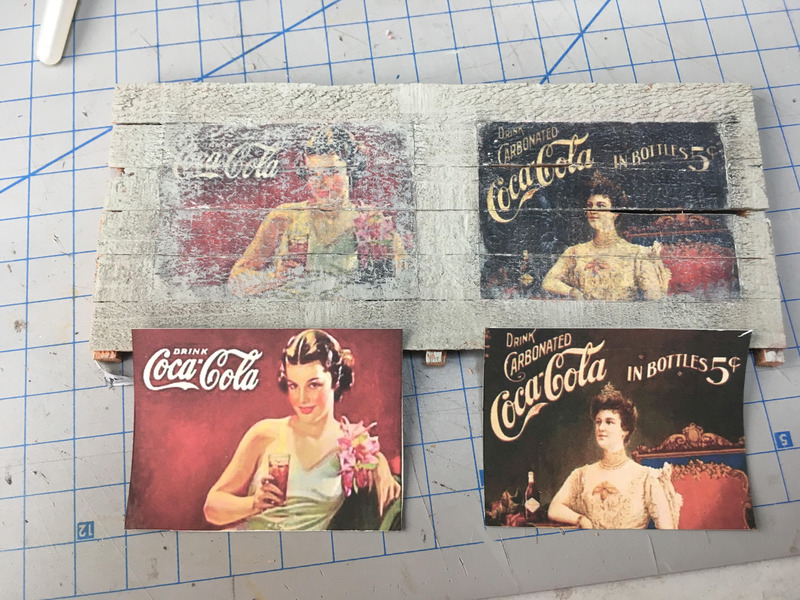 Link to mod podge transfer medium. Bill: That's a really good question. I'm afraid I have no idea. Would be nice to experiment with plastic, pvc board, brick, and stone surfaces, with texture and smooth. I don't do much with those other surfaces so have no current plan try things like this out. If somebody tries please let us all know! Jim, will the process work on other materials like plastics or does it have to be wood? You can see a few more bits of into about this kind of sign starting at this page of my Mik build: [link] (scroll to the bottom of the page). That's looking great Jim. I need to use this technique on my blacksmith shop build and you have already cleared a few things up for me. I agree with John, list the product you are using at the very beginning. Thanks Jim - I didn't watch the video yet. Does it explain what the "gel" is? I want to try this. Folks: I've started my step-by-step tutorial article on image transfer signs [link to article]. Feedback is helpful (just leave comments here if you please). Is this the right level of detail? Too detailed? Missing something essential so far? Thanks Dan. Rick: ordered. Those look like a good size. Thanks for the pointer! In my buildings etc. that come apart or move, I use "Deans Micro Plugs" 2NR or2NB, red/black, doesn't matter for lights.